Cheng Yu-tung - patriarch of the New World Group - has transferred his personal stakes in six Hong Kong-listed companies valued at about HK$3.8 billion to a family holding company, almost four years after announcing his retirement from the group. The transfer of his holdings to Chow Tai Fook Capital, which took place on Dec 21, included shares in apparel retailer Giordano International, Hsin Chong Construction Group, Integrated Waste Solutions Group Holdings, Mongolia Energy, New Times Energy and Shengjing Bank Co, according to filings with the Hong Kong Stock Exchange. Share prices of all the companies involved, except Shengjing Bank, have lost more than 20 percent since February 2012, when Cheng stepped down as chairman of New World Development Co, which went public in Hong Kong in 1972. The 90-year-old magnate's sprawling conglomerate embraces businesses ranging from real estate to hotels, jewelry and fashion. Andrew Sullivan, managing director for sales trading at Haitong International Securities Group, described the tycoon's move as "a type of personal estate management". 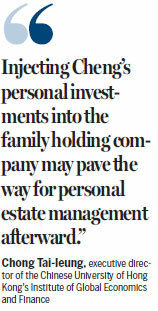 Cheng could move more of his assets to family members in future, he said. "Injecting Cheng's personal investments into the family holding company may pave the way for personal estate management afterward," said Chong Tai-leung, executive director of the Chinese University of Hong Kong's Institute of Global Economics and Finance. Chow Tai Fook Capital is a major shareholder of Chow Tai Fook (Holding) Ltd, which controls property developer New World Development and Chow Tai Fook Jewellery Group. Cheng, whose net worth is estimated at $10.3 billion, was Hong Kong's fourth-richest man before the share transfers, according to the Bloomberg Billionaires Index. He was hospitalized in September 2012 and has not attended public events since. His son-in-law, William Doo Wai-hoi, said last month the elder Cheng's health was improving, the Hong Kong Economic Journal reported on Tuesday. Maria Cheung, a spokesperson for New World Development, said the company does not comment on transactions related to the Cheng family's personal investments and personal issues. 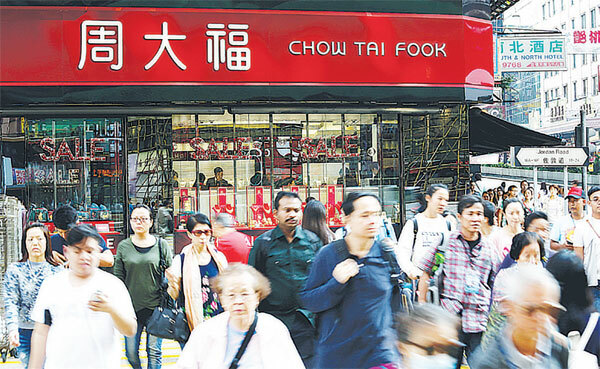 Chow Tai Fook Jewellery Group Ltd's share price dropped 1.18 percent to close at HK$5.01 on Tuesday.